The ‘quadratus lumborum’ sounds like something you’d expect to find among the pages of a maths textbook but no, this is a muscle in your own body situated around the lower back area. If the quadratus lumborum does not receive adequate attention, it can cause potential problems such as lower back pain as well as an array of posture issues. In this post, we’ll look at what the quadratus lumborum is and how it can cause problems if not properly stretched out. We’ll also take a look at the best quadratus lumborum stretch and release techniques to relieve any issues that you may have. The quadratus lumborum is a muscle in the lower back which sits on either side of the spine. It attaches onto the lowest rib of the rib cage (12th rib) and stretches down the lumbar vertebrae to the back of the pelvis. You can see one of the quadratus lumborum located in the bright red portion of the diagram below. The two quadratus lumborum work together to help with extending the lumbar spine such as the movement involved in arching the lower back. In addition, when you bend your torso to one side, the quadratus lumborum of the side you are bending towards will contract and shorten the space between the side of the pelvis and the rib cage. The quadratus lumborum muscles are notoriously prone to becoming tight in many people with the tightness being experienced primarily on one side only. As is often the case with the human body, it will never obtain perfect symmetry as we go about our daily lives. We tend to like to stand with our hips swayed with our weight shifted to one side more than the other which can lead to imbalances in the body. As a result, our muscles will adapt to the positions that we hold them in for long periods either causing a muscle to become chronically too long or too short. In the case of the quadratus lumborum, any time you hold your body in a positon where you have one side of the hip tilted up higher than the other side, you will be causing an imbalance between the two quadratus lumborum muscles. On the side of the pelvis that is constantly being lifted up, the space between the pelvis and the lower rib on that side will become short and tight whilst the opposing quadratus lumborum will become long and stretched. Holding positions like this for long periods of time will cause the muscles to adapt to these unnatural lengths. Continual tightness in one quadratus lumborum can be problematic. A person suffering from a tight quadratus lumborum will often find that they may experience lower back pain on the tight side which can become inflamed due to the tightness. Someone with a tight quadratus lumborum may also notice that one of their hips may seem slightly higher than the other. This is because the tight and shortened muscle is pulling up the pelvis on the tight side more than the quadratus lumborum on the other side. Care needs to be taken when diagnosing a tight quadratus lumborum as having one hip higher than the other could also be a result of having one leg longer than the other. If you think you have a tight quadratus lumborum then you are going to want to fix the issue as soon as you can. Firstly, if it is causing you pain then it’s a no-brainer why you want to get this fixed. Secondly, you will want to restore as much balance to your hips as possible to improve your posture and athletic performance. 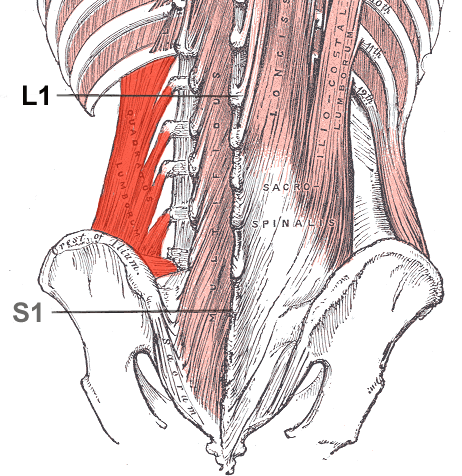 Release the tight quadratus lumborum by targeting trigger points using self-myofascial release. Stretching the tight quadratus lumborum using effective stretching techniques. Avoiding postural habits that put your hips in an unnatural position with one hip higher than the other. Bonus Step: If necessary you may want to strengthen the side of the quadratus lumborum that is long and stretched. Before proceeding it is worth making sure that you aren’t confusing a tight quadratus lumborum with tightness in the muscles that run along the spine (spinal erectors). If this is the case then you may find running a peanut massage ball carefully down the spine beneficial. The first step is to release any knots that may have developed on the tight quadratus lumborum. You can get someone to help you massage the area, but we will focus on self myofascial release techniques. For best results you will need a Theracane (massage stick) or a small massage ball. A foam roller is unlikely to work as it is too big to reach the correct area. To release the quadratus lumborum using a Theracane lie on your back with the Theracane in your hand. Place the hooked curve underneath your lower back and push the knob into the areas around your spine. Manipulate the Theracane around that area and work your way down from the top of the quadratus lumborum down towards the pelvis. Anytime you find a tender area hold the Theracane down on that spot. Release after 30 seconds and work towards another area. To release the quadratus lumborum using a massage ball, place the ball on the floor and lie on top of it so that the quadratus lumborum is put under pressure. If you have a particularly tight quadratus lumborum the pain may be quite intense. Try to hold the ball on the tender areas for at least 30 seconds. Work your way around all the tight areas on the quadratus lumborum. If you feel you need more pressure, you can place the ball on a block like in the video above. Once you have done your initial trigger point release of the quadratus lumborum you can begin to stretch the quadratus lumborum. To do this stretch position yourself in a similar position to above seated on the floor. If your left side is tight, put your left hip behind you at a 90 degree angle with the other foot in front also at a 90 degree. As you reach forward with your left hand, push your left hip away from the outstretched hand. Try to elongate the area of the quadratus lumborum. You can also try leaning forward to intensify the stretch. For full instructions watch the video above. The video also covers trigger point release of the quadratus lumborum. This stretch requires a bit of flexibility in the legs to be able to achieve this quadratus lumborum stretch. Whilst seated on the floor, move your legs apart from one another so you are almost in a split position. Using one arm, reach to the opposite side and try to touch your toes. You should feel a stretch in one quadratus lumborum. Repeat on the other side to hit stretch both quadratus lumborum. This quadratus lumborum stretch will require a stability ball. Stretch yourself over the stability ball and turn yourself onto one side. Keep both feet on the floor with one foot in front of the other, maintaining your balance with one arm on the ground. Reach the other arm in the air and pull it away from the hip to feel a stretch in the quadratus lumborum. You can move the lifted arm back and forth until you feel the optimal stretch. This quadratus lumborum stretch is the one that I find works best for me, and coincidentally it requires the least effort! In a child’s pose position stretch your arms forward as far as you can. Next walk your hands out to the opposite side of the quadratus lumborum you want to stretch and at the same time trying to maintain as much length as you can in the lower torso. Wiggle around until you can feel the maximum stretch, then hold this position. Once you’ve found the optimal position, hold it and breathe. I find that this stretch is also one of the more effective quadratus lumborum stretches, in addition to the child’s pose stretch shown above. To perform this stretch, stand up straight and reach out to one side. Create as much length as you can in the side of your body by pushing your hips down and arms up. Once you’ve got the maximum stretch, bend forward hinging at the hip, and to the side maintaining length in the lower back. You do not have to go as low, nor be as flexible as the lady in the video in order for this stretch to work. Repeat on the other side to stretch out the other quadratus lumborum. If you follow all these steps you should find that your tight quadratus lumborum should stretch out over time, which should hopefully result in a levelling out of your hips and a reduction in pain (if you were experiencing any). However, be sure to address any of your posture habits where you may be knowingly (or unknowingly) raising one hip higher than the other. Your body is a clever piece of equipment in that it is highly adaptable to how you hold your body on a day to day basis, which is both good and bad. The bad is that if you hold your body in unnatural positions for too long, the muscles will ‘set’ in these positions. In the case of the quadratus lumborum, if you frequently hold one hip higher than the other for a significant length of time, one quadratus lumborum will become shortened.Therefore it is important to first identify when you tend to raise one hip higher than the other, and then try to stop doing that. Sleeping on one side – If you tend to sleep on one side more than the other, the hip that is in the air will tend to bend toward the rib cage which shortens the quadratus lumborum on one side. Holding this position over night will allow the muscle to become used to this new shortened position. If you can, it would be better to try to switch to sleeping on your back. Arching your back – Many people who sit for long periods of time will try to sit up straight by arching their lower back in an effort to improve their posture. The truth is, this isn’t the best way to correct posture and if held for long periods of time will put both sides of the quadratus lumborum in a shortened position. The correct sitting posture must be learnt to avoid this. Constantly lifting one hip – This one is close to home for me and there are various ways you may do this. For me, I noticed that whenever I am seated in a desk chair I tend to favour leaning toward one arm rest more than the other. In addition, even if there isn’t an arm rest to lean on, I will automatically hike up one hip. After learning of these release and stretching techniques I tend to not do this anymore. Look for any situation where you may lift one hip higher than the other. As we’ve discovered, the presence of one tight quadratus lumborum usually means that the other quadratus lumborum will be long and stretched. Along with this lengthening of the quadratus lumborum, can also come weakness. A bonus step to creating stability across both quadratus lumborum could be the need to strengthen the non-tight side. There are a couple of exercises that can accomplish this. Exercises such as side planks, cat-cow and a modified prone cobra with a focus on the weak side should all work. You can watch the video above to get further ideas. This step isn’t essential, however, you may find it worth trying if you don’t see results from following the other steps mentioned in this post. If you follow these steps you should be able to regain some symmetry in your hips by stretching out the quadratus lumborum. As I mentioned in step 3, stretching is all well and good, but you must look to eliminate any bad posture habits you may have to see results that stick long-term. This was a really helpful video! How can I tell which QL (left or right) needs to be released and which needs to be strengthened? I’m sore on both sides. But I tend to sleep on my left side while sleeping, lift my right leg up and bent across the other leg while sitting, and feel like I’m leaning all my weight onto my right leg/side when trying to dead-lift or squat. I feel like it is likely my left QL that is weak and needs to be strengthened (despite it hurting sometimes) and that my right QL is compensating for the disparity. From what you’re saying it sounds like your right QL is tight. If you are sleeping on your left side then the right hip will be hiked up overnight with the QL in a shortened position. So you may want to release and stretch the right QL. I also have to point out that none of these videos have been produced by this site they are all taken off youtube. To get advice from the people who created the video it would be best to post questions in the comments under the videos on youtube.